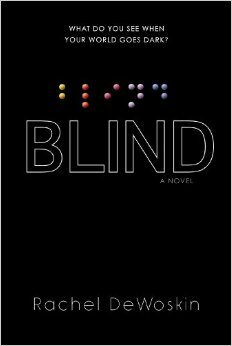 The book I’ve chosen this week is ‘Blind’ by Rachel DeWoskin. In this novel the main character Emma has been blinded by a freak firework accident. She has been blind for around a year and has decided to be mainstreamed back into her old school with her old friends. Friends she grew up with and who knew her before the loss of her sight. However, one friend is not returning to school – a member of their school community has been found dead, suspected suicide. Emma has to learn to deal with being blind as well as learn to deal with her grief and confusion over the death of her friend. family – those people who love and protect you – is even more terrifying. As a parent, the idea my son could lose something like his sight while standing with me scares me. Emma has to deal with the idea that the people who she always trusted to protect her were unable to keep her from such a negative life change. Emma has five sisters – one who is a baby – and one brother, and parents who love her and worry about her safety at all times, especially now. Her best friend Logan has her sight but does not have a supportive family who looks out for her; this is an issue with the girls and one that is never resolved. Logan is very supportive of Emma as she re-mainstreams, as is Leah. In fact, her whole family, other than her sister Sarah are supportive and do what they can to help her adjust to her new life. As Emma continues through her year, she learns more about what it means to be a friend, a sister and a daughter, as well as what it means to be a blind person in a sighted world. The title of Blind is double edged. Emma is a good person but she is blind to the needs of others. She sees, so to speak, just what is related to her life and not what is happening in the lives in others. This is a realization she comes to herself, as she gets past the physical changes in her life and begins to realize the emotional. As a character she develops and changes from someone stuck in her own physical changes into someone who can feel and emote about the emotional needs of others. this change is helped along with the examination of the suicide of her classmate. Emma is forced to look externally and see her role in the world bigger than the loss of her eyesight. I really liked this book. it presented a realistic view of what a nice, smart, caring teenager would go through if presented with such a freak accident. Reading as she learns how to both physically and emotionally cope with her world is a a story that is told in a realistic and gripping way. Relationships are hard at any age and when you throw in a major physical change, they become even tougher. Having Emma become blind, allows for the metaphor of emotional blindness to shine through and makes her journey to being a better person a more satisfying one for the reader. For me, it is her relationship with Sarah that is the lynchpin -once she realizes more about Sarah, Emma is able to know more about herself. At times there was a lot going on however, that seemed appropriate to the lives of the characters. I would recommend this book to those who enjoy reality novels and like to watch the development of a character in to someone who is emotionally mature. In addition, anyone who has experience with people who have vision issues will appreciate the struggles faced by Emma and her family. I read this book on my Kobo, finishing it August 26th. It was published August 7th, 2014 by Viking Junior, ISBN 9780670785223. 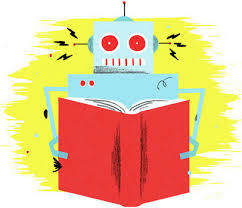 This entry was posted in Books, Reading, Reviews and tagged blind, Rahel DeWoskin, review, ROBOT. Bookmark the permalink.